As I mentioned in my introduction to the Cornish Riviera, St Austell is not included in the Area of Outstanding Natural Beauty (AONB) that covers most of this coastline, and there’s one very good reason why – China Clay. The industry was good for local employment, but not so good for the environment, and was considered a blot on the landscape. Most of the workings were (and still are) in the area just north of the town covering a large area around Hensbarrow Downs. Clay isn’t mined like tin and copper but uses an open cast system, which leaves large pits scattered across the landscape. The spoil is then tipped into heaps, and unlike coal it’s white. 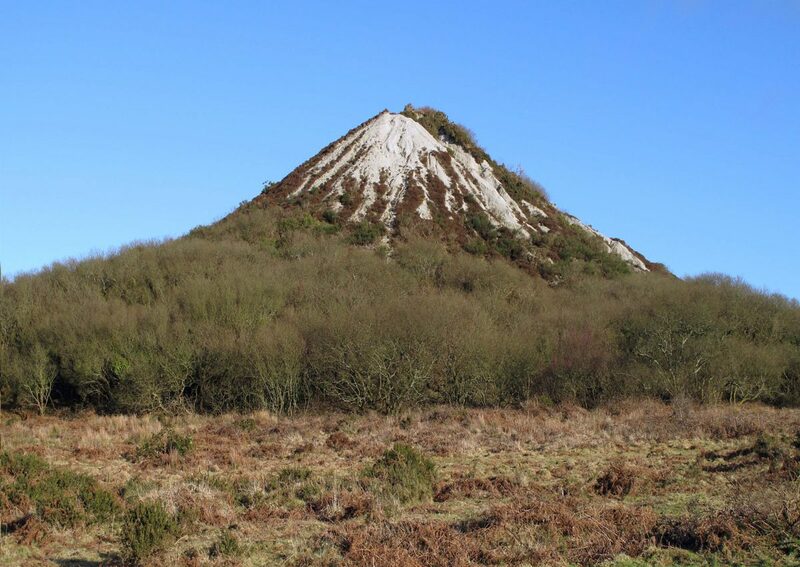 These spoil heaps were conical in shape and appeared like mountains which earned them the nickname of the Cornish Alps. The whole area looked like a lunar landscape up close but in recent times much of the area has greened over, and as strange as it may sound, I miss the old lunar landscape somehow – don’t ask me why. China Clay is still worked in the area, although not with the same intensity as it once was, and if you’re interested in finding out more, then I can highly recommend a visit to Wheal Martyn at Carthew. Some of you would have heard of the Eden Project, which is one of Cornwall’s major attractions and constructed within an old clay pit. It lies just to the east of St Austell at Bodelva and is a must see in my opinion. The clay industry made St Austell the largest town in Cornwall for many years but a recent census shows that it’s been overtaken by Falmouth, Penzance, Camborne, and Newquay, and if I’m being totally honest the town wouldn’t be high on my list of recommended places to visit. Having said that, it’s only a stone’s throw from St Austell Bay which includes Charlestown and Mevagissey and are places that I would certainly recommend.